Naturally, you will need a videocard that supports TV-out. At the moment of this writing, I only cover videocards by ATI and nVidia. 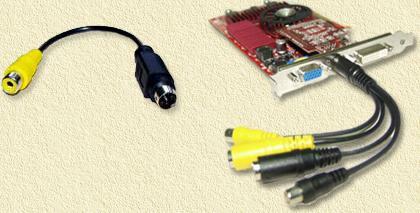 This page you're looking at right now is a generic approach on how to connect the proper cables, and how to identify if your PC videocard supports TV-Out. For specific software settings, see these pages: ATI cards and nVidia cards. I'm aware that there are more TV-Out enabled videcards, however I do not own them, so if you have one and are prepared to write a page on that particular card, then please let me know, it will be highly appreciated by other WeetHet visitors (mail me)! Does my videocard support TV-Out? OK, so what do we need to connect your PC to a TV? Naturally we do need some kind of connection on our PC to connect to the TV, we're looking for a TV-out connector. TV-Out only means: VIDEO out in such a sense that our TV could be able to handle it. A lot of laptops do have a TV-Out as well. Tip: When buying a laptop, make surte it has TV-Out. Laptops are portable and can therefor be placed next to your TV when you decide to watch a DivX movie! Note: TV-Out only means that there is a Video signal comming from this pin, that can be connected to your TV. This is an entirely different signal than the signal needed for the antenna connector on your TV! DOES MY PC HAVE A TV-OUT (Video Out)? Commonly, you will be able to identify this by looking at the back of your PC, look for the VideoCard (your VGA monitor is also connected to this card!). Most videocards by ATI and nVidia (but not all!) have such a connector. It's a MUST for a modern videocard. Tip: Since price difference is minimal or even zero, make sure a videocard you want to buy has TV-Out. You might not use it right away, but it is damn handy later on. Adding one later is very difficult if not impossible! Usually special cables come with these cards, that convert the connector to a more common connector, like a tulip connector for composite video. Tip: When starting out, do your first attempts to connect the PC to a TV using the cables that came with the card! Naturally, when you TV supports S-VIDEO, then please use a S-VIDEO cable to connect your PC to your TV as it will result in the best quality. Some cards have a tulip connector (see C in the pictures below). This commonly is a Composite video signal, where color and synchronisation signals are mixed into 1 signal. Combinations of S-VIDEO and composite video occure - although rarely - as well. 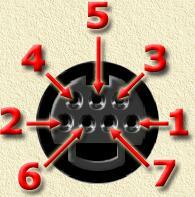 Below you'll see some pictures of TV-Out connectors. 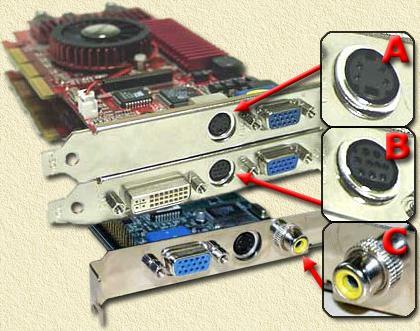 PC's with an onboard videocard or laptops, can have TV-Out connectors as well. In the pictures below you see images of a Shuttle SN41G2, a Sager laptop and a Toshiba laptop. TV-Out is all nice and dandy, but we do need a similar connector on the TV-Set, called TV-IN or Video-IN (also: AUX or EXTERN). Do not forget that you will also need to connect your sound card to the TV for sound! We do need the LINE-OUT connector of the soundcard for this purpose. 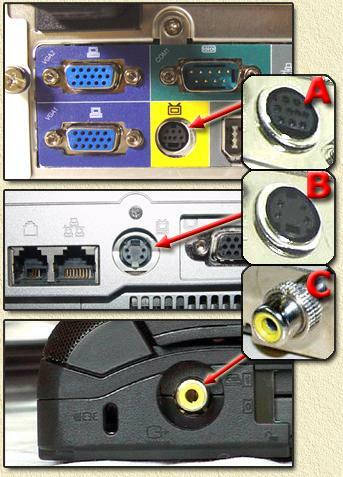 Tip: if you TV is missing a suitable connector, then consider using your VCR instead if this one does have a suitable connector. Set you TV to the VCR channel en set your VCR to AUX or EXTERN. This round connector, usually on the back of yout TV, is intended for the antenna or cable. This is not directly suitable for use with your PC's TV-Out! The signals (video and audio) of your PC are connected to the RF-modulator using tulip connectors. Tip: Most RF modulators you can buy are MONO AUDIO, so make sure you're buying a STEREO version! 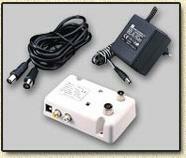 Commonly you will find these RF-modulators (VHF) at satellite stores. Commonly used in European TV equipment. One simply presses the connector on to the connector in the TV. This connector is rarely found in the US. This connector is more common in the US. One "screws" the connector to the TV. This rather weird connector is commonly used in European TV equipment like TV, VCD, DVD, etc. I haven't seen these much in the US. Usually you'll find it at the backside of your equipment. The great thing about this sonnector is that it holds all connections you'll need - including audio. *Note: the pinmber between brachet, indicate the pins of a S-Video connector! Note: We do need to connect Audio as well with this connector. Audio can be taken from "LINE-OUT" of the soundcard! In the S-VIDEO section, you will find more info on the S-VIDEO connector. More recent TV's have separate tulips for audio and video input. Sometimes on the front, side or back of a TV or VCR. Note: the core of the tulip connector is the signal. The silver ring around it is shielding. The cable on the right is for example for use with TV-IN enabed cards. S-Video isn't used often in Europe. In the US it's a more common connector. The advantage is that this is a rather small cable. The downside is that it's not so very easy to insert the connector. After connecting the hardware we do need to do some settings in the software of the PC. Required settings for TV-Out are usually done using tools that come with the drivers of your videocard. As these are different for each manufacturer, we will discuss these on a different page. ATI cards used to be mostly used in laptop, but now a days ATI is working on a strong come back in desktops as well - and in my option offer much more performance than their nVidia counter parts. nVidia is commonly known for it's desktop graphics, but has entered the laptop market as well with their Geforce2Go and Geforce4Go. They're not bad, but I still prefer ATI. Note: do not use the drivers for the desktop graphics cards on laptops. Rather use the drivers you can download from the manufacturers website of your laptop! Currently we have these descriptions for videocard: Software settings for ATI cards and nVidia cards (Geforce/TNT).